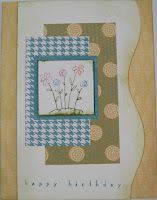 For this card I used Whisper White CS and Sweet Pea dsp. The stamp sets I used are Merry Mix and All Holidays. I colored the flowers with my markers, Old Olive, Taken with Teal, Only Orange and Rose Red.